A Paiute deadfall trap is a useful tool in killing mice, rats, and other animals with similar size. 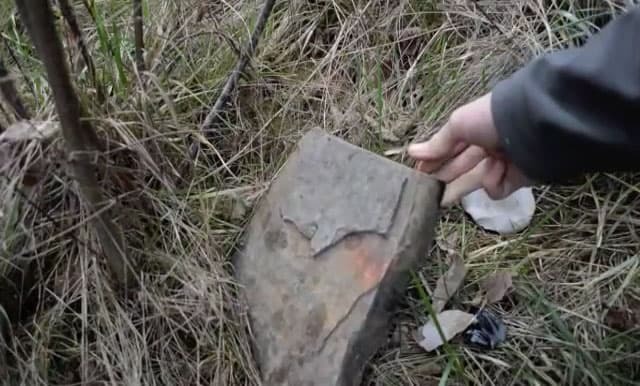 Matter of fact, it’s one of the most popular primitive traps that have been ever used and is still used by many people nowadays especially those who take adventures in the wilderness pretty seriously. 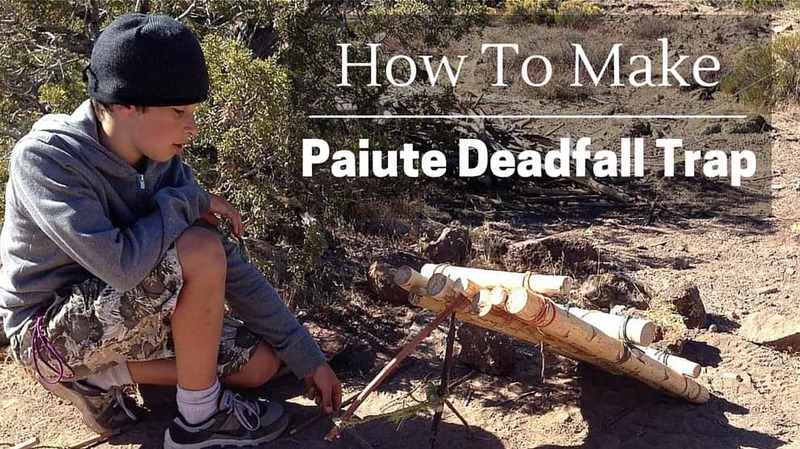 If you are fond of survival tasks, you might want to learn how to make a Paiute deadfall trap. There are multiple possible applications for this primeval trap method, but the most fundamental one is hunting for food. For instance, if you are alone in a dark forest with no food or anything to eat, you can create this trap to capture something. 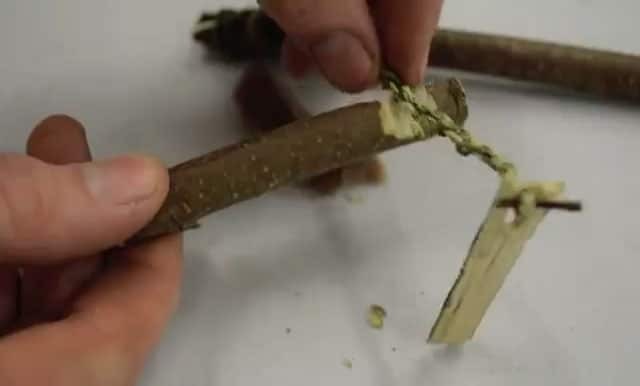 A Paiute deadfall trap is quite similar to Figure Four deadfall trap only that the former uses four sticks and a piece of cordage while the latter uses only three sticks. What makes Paiute better than Figure four is it consists of extra components that allow a more sensitive trigger system when trapping small game. There have been experiments comparing the efficiency of Paiute versus Figure Four and results show that success rate increases with the Paiute method. So the next time you set foot into the wilderness and want to make some action, you ought to use Paiute as your way of capturing small game. 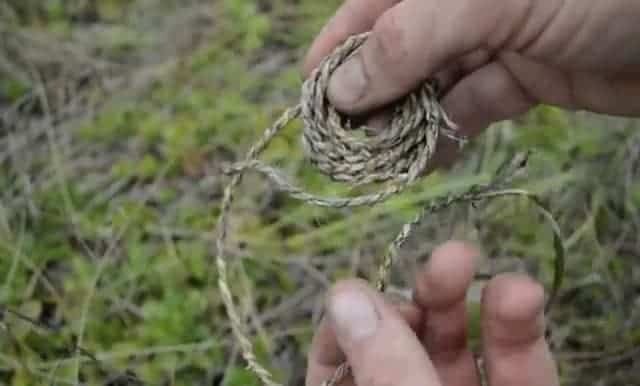 The first thing you need to have is a string or natural cordage. Since you’re doing a “primitive” trap, it would be nicer to use Stone Age primeval materials and techniques to live up to its definition. For instance, you might want to use natural cordage rather than conventional strings that can be purchased at local stores. Resourcing materials from nature (without any tools from the civilized world) makes things more exciting in the wilderness. However, if you just want to make this trap for home purposes, say you just want to kill rats in your basement, then you are free to use materials that can be found at your home or hardware. Strong natural cordage can be made by taking the fibers of individual plants and twisting them together using two-ply twist method. Examples of great cordage fiber plants are Dogbane, Cedar bark, and stinging nettle. Once you have your rope or natural cordage, you will need to find your deadfall rock. Requirements for a good rock is flat, a little large, and most importantly, heavier than the animals you want to catch. As stated above, it would be a lot cooler to only use tools and materials that are available in nature. This knowledge comes in handy whenever you are in a real survival situation with no tool from the civilized world at hand. 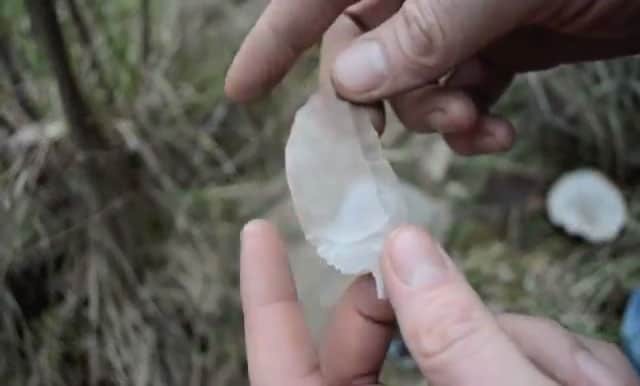 You can make an excellent blade made out of flakes of flint. Sharp flint flakes can be produced by striking a piece of flint with a hammer stone (just any stone you can find nearby). 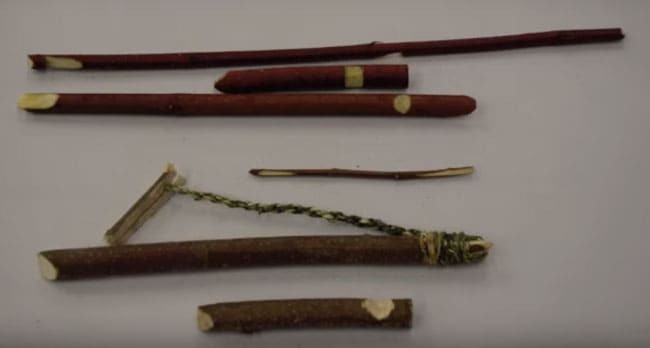 Find a stick with a diameter that is about the size of your thumb. 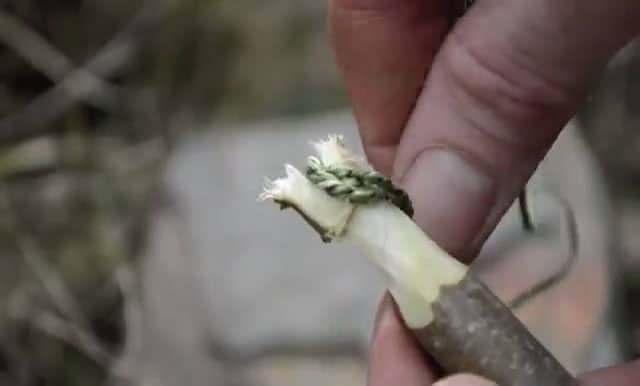 In the picture shown, the stick used is made out of hazelnut. First, cut a short vertical post stick that is about 3 inches and has a V-shape point on top. Now cut a longer stick, about 6 inches. This is called the longer angled stick because this serves as a support for your deadfall weight (which is the rock). Carve a notch near its end that will match the vertical post you just previously made. There are several ways to make the trigger component. 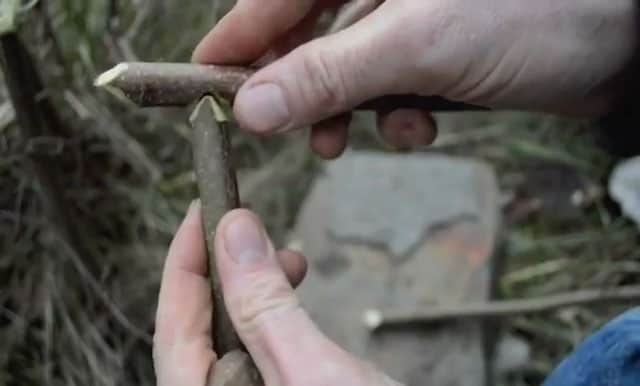 The most efficient way is to carve out a flat piece of wood and use a flint flake to drill a hole through it. This allows you to trigger the cordage through the hole of the trigger component then secure it using a knot or stick placed at the loop end. The other end of the cordage gets tied to the lower end of the angled stick. 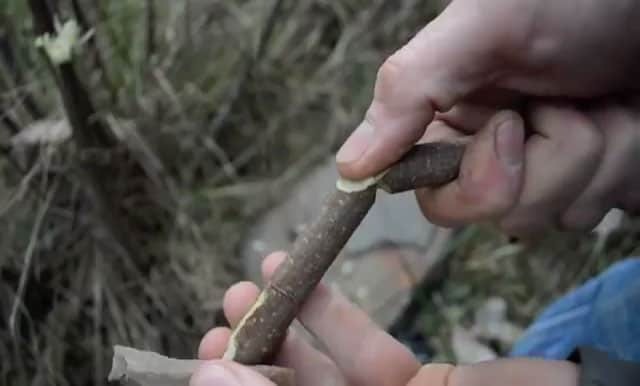 Now carve a “V” at the end of the angled stick and a knot all the way around it to help secure the cordage to the angled stick. Then carve a notch into the base of your vertical post stick. 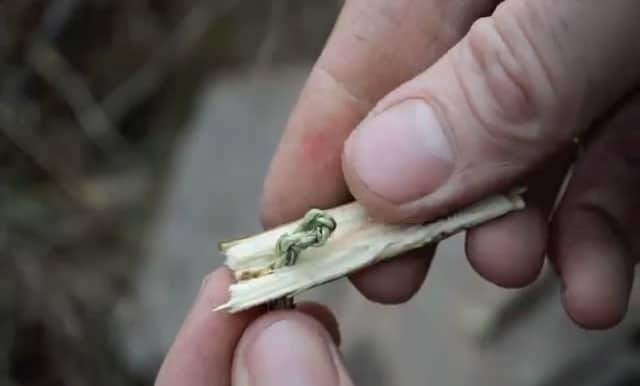 This will help keep the trigger mechanism in place and help prevent the trap from twisting as you place the deadfall rock on it. 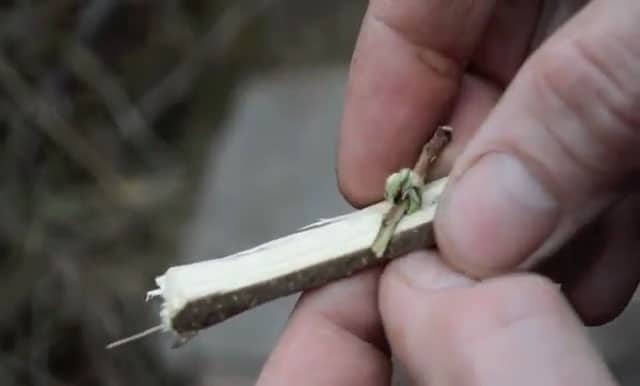 The last component is one small twig that will serve as your trigger stick to set off the trap. That’s it. Now it’s time to set the trap. 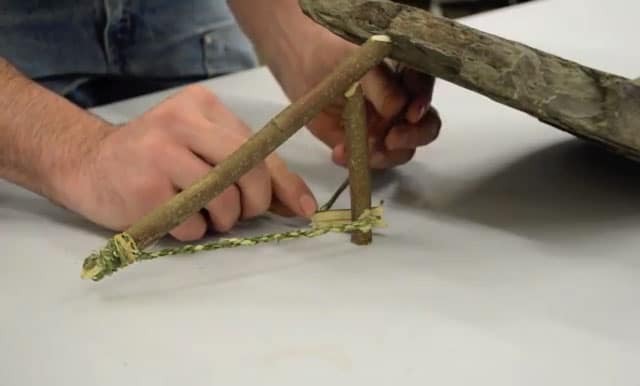 To set this trap, balance the angled stick on top of the vertical post stick and then place the rock on the edge. Now wrap the trigger mechanism around the notch in the base of the post stick and set the trap using the trigger stick which is wedged between the trigger mechanism and the rock. Now your trap is set and is ready for action! Don’t forget to put bait underneath the rock. Once an animal comes by and trips the trigger stick while trying to get the bait, the rock will instantly fall and kill the animal. It’s important to set this trap under real conditions so that you’ll see how it works and for you to make adjustments to make it even more successful. Modifications may include changing the height of the post stick or the angle of the rock. These factors may seem simple but have a great impact on whether the animal can escape or not. In some cases, rats are harder to catch compared to mice. Rats seem to be “smart” enough not to sit on the deadfall when pulling the bait out. A proven effective solution for this is to tie the bait at the end of the trigger stick. There you have it! 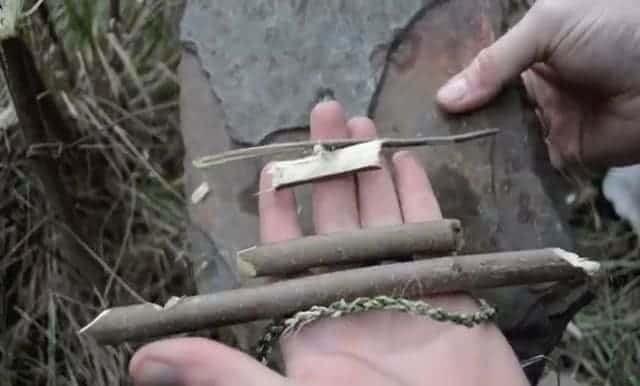 Four sticks, a piece of cordage, and a flat rock are what comprise of your very own primitive trap system.